Today a trusted media partner sent me a note about a Google search he had done on Starbucks during his business trip to Seattle. The subject line of the email: “Starbucks” search results & you! wow… Curious, I opened the email to find a screen shot of what his search result delivered. Interestingly enough – there is a new feature in Google’s search results that I had not seen before. That feature (in Beta, of course) delivers results for your search from people in your social circle. I know for a fact that this partner reads my blog from time to time and has it delivered as an RSS Feed to his iGoogle account. Google recognizes that, and delivers a search result based on that connection. 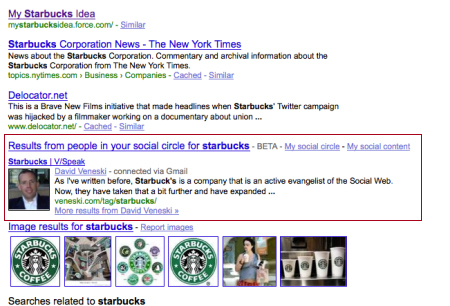 Nice job Google – closing the loop on keyword search and your personal social graph. I’m impressed.